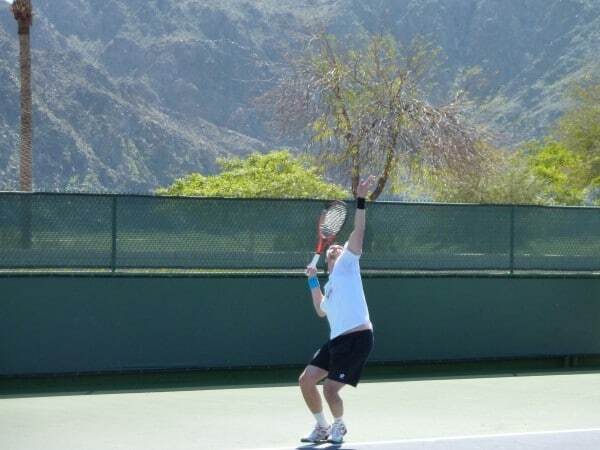 Sue had a great post about her experience at Indian Wells this year. Instead of just recounting my experience at Indian Wells this year which was not too different from Sue’s, I thought I would talk about my experiences over the last few years. I first went to Indian Wells in 2010. It was a dream of mine to finally see Federer in person. For years I watched a lot of tennis especially Federer on TV and talked about seeing it live. My husband suggested I buy tickets but I didn’t know anyone who wanted to go. He wasn’t interested and I didn’t want to go by myself. He suggested I take my son. I thought it was a great idea, so I bought tickets and took him. Thomas was just 6 at the time. I bought it months in advance and we were both so excited to go! When the day finally arrived it was so amazing walking around the grounds and watching players I had only seen on TV like Marin Cilic, Juan Carlos Ferrero and Robin Soderling. We also got to see Nadal play a match. Federer did not practice or play that day which was disappointing. In 2011, I hoped it would be our year to see Federer play. I had started watching him in 2005 in the Australian Open semifinals against Marat Safin and I was hooked. Even though he lost, I so enjoyed his style of tennis. It was such a pleasure to watch tennis again after losing interest in tennis after Edberg retired. I followed tennis and Federer very closely after that. My husband found 2 stadium box seat tickets being sold on Craig’s List (an online network with classified ads). We took a chance and hoped the seller was legitimate. It turned out to be fantastic seats. Unfortunately for us, he wasn’t playing the day we went. Both my son and I were disappointed, but we were determined to see him even if it was just a practice. We were very lucky he was practicing that day and were able to get seats near his practice court. It was fun watching him serve and hit some balls in a more relaxed atmosphere. We got to see Verdasco, Ljubicic, and Nadal play matches that day as well. We had such a great time. I couldn’t stop talking about it. So the next year, I bought day session tickets. I was also armed with a better camera (an SLR camera instead of the point-and-shoot from the previous year). The first day we went, Federer was playing the night match and I didn’t have tickets. Imagine my disappointment when I realized I might not get to see Federer play for the third year in a row! I didn’t know if he would be playing the next day so I decided to take a chance and try to buy night session tickets at the box office when we arrived that day. I managed to get some seats way up high in the stadium. 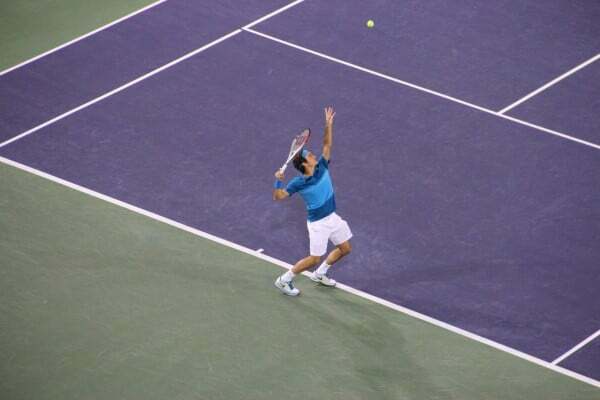 We were treated to an amazing night match with the up-and-coming Milos Raonic. Even though we were far away, it was a great 3 set match. Federer lost the first set in a tiebreaker but came back to win the match. My son and I laughed at the fans that sat next to us, all we heard was Go MILOS! the entire match. The next day, it turned out Federer was playing during the day. We were so excited! We knew we would be seeing him up close! We sat not far from the area where the players entrance was. Thomas decided at the end of the match that he wanted to try to get Federer’s autograph. He got near the wall and hung over it with his tennis ball and waited. People were shoving and pushing their way to the wall. I was trying to find a spot to take a picture but it was so crowded. In the end, Federer signed a few items near him but Thomas just missed Federer. He was so sad when he didn’t get it. He was struggling to hold back the tears. I tried to cheer him up by getting him some pizza (his favorite) but he was so sad. While we were eating, a couple approached us and gave us their tickets for the evening session to the Nadal doubles match on stadium 2. I was happy we didn’t have to leave yet after the disappointing end to the Federer match. Thomas wasn’t too interested. When we got to the stadium we were amazed that the seats were in the front row right behind the players! We watched the end of a match where Gilles Simon defeated Ryan Harrison. Afterwards, Thomas was able to get Simon’s autograph with a little help from a fellow fan. He was so happy. After that we watched Nadal & Marc Lopez defeat Paes/Stepanek in a fun doubles match. Nadal even tossed a towel to him as he walked off the court. Although Thomas didn’t get Federer’s autograph he was happy to get a one autograph. Federer went on to win the tournament and it was a very satisfying Indian Wells experience that year. 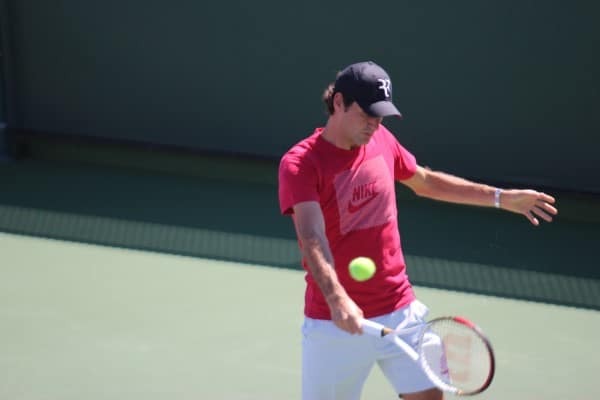 We went again in 2013 and saw Federer up close at a practice session. We sat for over an hour in the blazing sun to see him (he was late of course). When he finally came and practiced, the waiting and heat didn’t seem to matter anymore. Everyone was just in awe of the effortless way he hit the ball and how relaxed his practice session was. I had my brother’s big telephoto lens and I had fun taking lots of pictures. Then we watched him play against Ivan Dodig in the stadium. He was rolling through that match until we neared the end of the match. That was when he hurt his back. At the time it didn’t seem that bad but when he played the next day against Stan Wawrinka you could tell his back was affecting his play. He won the match against Wawrinka, but Wawrinka should have won. Last year I bought tickets for 4 days. My husband and daughter went with us for the first Sunday. I bought less expensive seats and we were treated to fun matches with Berdych and Isner. It was fun sharing the experience with the whole family. We saw him easily defeat Dimitry Tursunov. I went the next day with just my daughter for the first time. She waited in line and got an autograph from Andrea Petkovic. We also got to see Nadal and Federer again! I took my son on Wednesday and we were lucky enough to see Federer play. Federer won in straight sets against Tommy Haas. It was a pleasure to watch them exchange one-handed backhands. We also saw some entertaining matches with Gulbis and Fognini. Federer practicing in stadium 2. This was one of my favorite pictures. I bought tickets for the Quarterfinals on Thursday but Federer was not playing. Instead we watched him practice on the new Stadium 2. We got there early enough to sit in the front row and watch him practice. We were behind the baseline on the same side of the court as him. It was a blast to see him so close. I got some great close up shots of him. Unfortunately, his back was to us most of the time. In 2015, we were treated to a very competitive match with Dimitrov vs. Kyrios. It was unfortunate he twisted his ankle late in the match. We were lucky again to see Federer twice during the 3 days we went. He played his opening match on the first Sunday against Diego Schwartzman. The match was a blow out but it was still so enjoyable to watch his fluid movements, his great serves and his beautiful backhands. I knew we would see Federer at least once during the 3 days but I didn’t think it was likely we would see him twice. Our last day we were treated to a good Nishikori match (unfortunately he lost), followed by Nadal and then Federer. 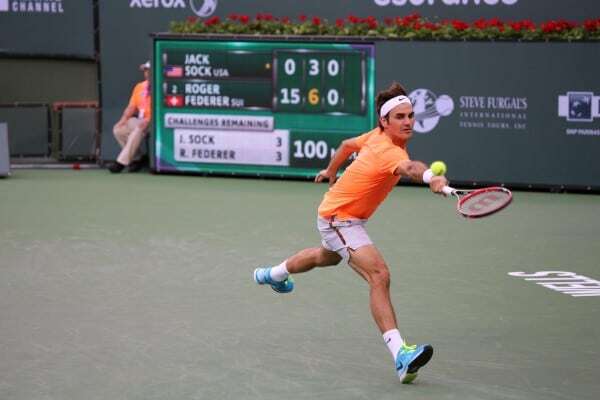 Federer played against American Jack Sock. It was another entertaining match that we knew Federer would win. 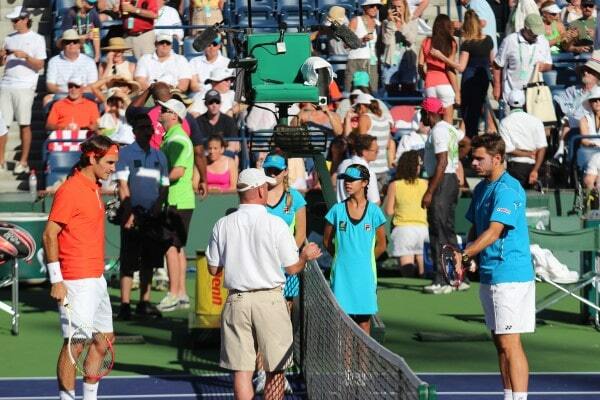 Near the end of the match Thomas decided to try to get Federer’s autograph again. We watched where and how the fans lined up for Nadal in the previous match so we made a plan on how to get to the wall and what to do. Unfortunately he was barred from getting into the area so he never had a chance to get his autograph. Once again, Thomas was in tears and I felt so bad for him. I decided to distract him a little by taking him to the gated area near the practice courts and see if we could get another player’s autograph. Djokovic was practicing and I knew he would be walking past the gate on his way out from practice so we waited there for 45 minutes in the hopes we could get his autograph. He walked out and Thomas was bold enough to call out to him and ask for his autograph. Djokovic came over and signed his ball! He was ecstatic! It wasn’t Roger’s autograph but it was the next best thing. We will definitely try again next year. It was a great way to end another year at Indian Wells. I will definitely be back next year! I really enjoyed the story Fran 🙂 How lucky are you to go to Indian Wells so often! The pictures are absolutely superb, you must be a professional photographer! Best pictures in a fan story so far I think, they are really well taken. Yeah I don’t even have a camera, just camera phone so any ones I’ve taken at tennis are pretty low quality. That 200mm focal length rule is daft, I think they only do it because they think spectators could then produce professional images and sell them which then effects the revenue of the photographers court side who do it for a living. Pretty sure checks will be lax though and most baggage checkers won’t know what’s what. I only brought a backpack the whole time, every compartment was searched from top to bottom. GoPros were banned, but I saw quite a few drawn out on the practice courts with selfie sticks. Must have hid them in their lunch boxes! Hi Conal! No, not a professional. I was fortunate enough to have a very good camera and some great telephoto lens that I borrowed. I ‘ve had a lot of practice over the last few years. Good seats helped too. I can’t believe they have those camera rules in Melbourne. What a drag. I walked into Indian Wells with a monopod, a big camera and regular lens, and a big telephoto lens. Thanks for the write up Fran – to go that many times and see the great man play and practice, fantastic! What a shame your son was not able to get his autograph, so disappointing. It’s a bit of a lottery – I think Susie got one at WTF as the seats she got were by the exit. I went in 2011, but my seat was nowhere near so I didn’t get one. It was enough to be there and see him play though. What an experience – I guess your son is a big tennis fan now? Yeah Susie pushed an old woman down some stairs then reversed a guy in a wheelchair from the front of the queue at the O2 to get Fed’s autograph. 😆 You have to be ruthless in these situations. HAHAHA!!! I can not stop laughing! Thanks Slamdunk! You’re encouragement is what helped get this story written. I was on the fence about it. My photography is a lot better than my writing. Well I’m glad you took the time and trouble – your pics are great, and nothing wrong with your writing at all. I’m not sure I would have the courage to write a piece, I’d be too frightened of Jonathan’s criticism! Good to hear your son’s a Fedfan – how could he be anything else? What a lovely childhood memory for him. Oh, and yes my son is a big Federer fan now! Thanks Fran! Great photos. Yeah, one of the best Fed matches I saw there was the Raonic match in 2012. Half the crowd is Canadian. Indian Wells is a very good venue to see the pros. Hard to get that illusive autograph! I know, I`ve tried. Hung over the wall too. Remember reading a story about a collapsed wall when a fan lent on it – was that you? Cute. If I knocked over that wall I would be on the court with massive head injuries. Or are these admin privileges? Perhaps that’s my only chance. Hi Fran..Thanks for sharing. That was lovely. My family has been to IW every year since 2007. Just to see Roger. I will stop going there if he retires. Hope it is not so soon. A signed Roger Federer air guitar. I was like “Hmmmn really!!? A Federer autograph!! !….wait, an air guitar…ohhh.” Nice one Jonathan. You nearly had me there. Thanks for this Fran. Everybody’s perspective is a little different, and so each story is special. I suspect this is true even for those who have been able to see a tournament live, and it’s DEFinitely true for those of us who haven’t. Plus there are always interesting comments from people who have been reminded of something by the original post. Thanks for taking the time to let us experience a little bit of your fun! If I lived in US, IW would definitely be a place to go for Fed-experience along with Cincy! It looks like one of the best venues for viewing practice. Great pictures, lovely stories, thanks for writing, Fran. Hopefully mine will follow not long! Though would you guys rather not be reminded what happened in Monte-Carlo…? Thanks for the compliment, Wanda. 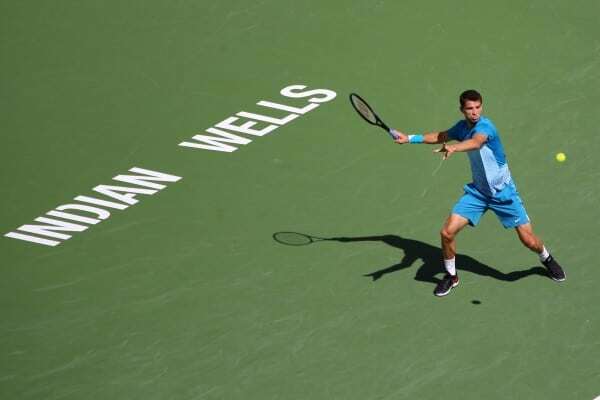 Although I have nothing to compare it to, I think Indian Wells is one of the best venues. You can even watch live streaming of 2 practice courts! I knew exactly when Djokovic’s practice was over because I was watching him practice on my phone! They have a great app too. Plus they have free Wi-Fi at all around the tournament and live streaming of three stadium courts. I would love to hear about Monte Carlo too! Yeah Wanda we want to know what the Canapés were like on the VIP terrace and whether the champagne lived up to expectation. I was more interested in buying a watch at the booth next to the VIP terrace instead of the champagne 😉 Who buys the Rolex coming to see tennis? We are all waiting anxiously, Wanda! Thanks for sharing Fran. Such a fun read. Does any one want to guess whose serve Federer is imitating in picture number 3 from the top (the picture below Soderling’s)? Thanks, Gaurav! It’s funny, I looked at that picture for 4 years but it never occurred to me that he was imitating Ivanisevic. Jonathan had a great name for Federer in this picture – Roran Fedanisevic! Pretty good copy. He does a decent imitation of Stan’s pin point serve too. ……aaannnnnnnddddddddd looks like it’s bye bye Nadal at Barcelona as well. Fognini for his second win over Rafa in a row. That too on clay. Bit of a shock loss but Nadal was missing a lot of shots and Fog is top 10 clay so always has a punchers chance. So apparently Wawrinka just divorced his wife. Ouch. Hope all’s good between them. She said some fairly strong things about him. Divorced? He said separated, but I didn’t see any mention of divorce. Yeah but would guess they will divorce. Dunno why they bothered making it public. Stan not really a huge worldwide figure so it could have easily gone unnoticed and just made some Swiss papers. I agree Jonathan, it would have been better that Stan made no comment as he left himself open to Ilhan’s response that he was using their separation as an excuse for his recent poor results, since it appears they separated after Davis Cup. Always better (if you can) to keep personal problems out of the papers. i wonder if all of this has anything to do with Mirka calling Stan a baby. We could create a soap opera here….As the Tennis Ball Turns or Coronation Strasse.